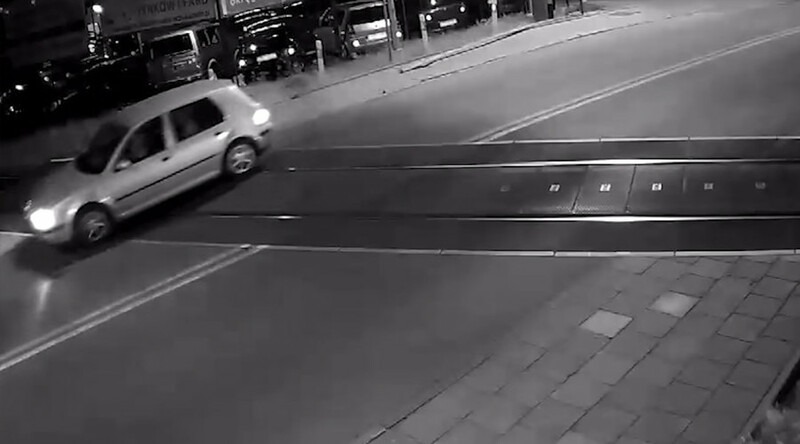 Surveillance cameras captured an incredible brush with death in Poland after a car carrying four people plowed through a railroad barrier and missed an oncoming high-speed train by mere seconds, only getting its tail light smashed. A driver and three passengers miraculously escaped injury after the Volkswagen they were driving in crashed through a railroad crossing in Koszalin, northern Poland, on Monday night. Seemingly unaware of the upcoming railroad, the car plows through the barrier and, shocked by the crash, comes to a stop just inches away from the train track. The back of the car was struck by the high-speed train, which heavily damaged the back of the vehicle. However, all occupants were lucky to walk away uninjured. The footage was released by the Polish state railway company, PKP, as a warning to drivers to remain vigilant around railroad crossings. The car’s 48-year-old female driver was fined 500 zlotys ($140) for dangerous driving, reports TVN.